Review written by and copyright: Rick Curzon (8th July 2018). and UNDERWORLD U.S.A. (1961), Fuller’s unflinching depiction of the brutal world of organised crime. This collectable four-disc box set also contains an array of new and archival extra features, limited edition booklets with newly commissioned essays, archival material, contemporary reviews, and full film credits, and is strictly limited to 6,000 numbered units. All of the films in this set are in B&W and obviously there’s no colour values to assess. Betwixt 1937 and 1952 the films here were all shot 1.37:1 Academy ratio and are slightly sharper than the latter two matted widescreen films (1959-60). These last two would almost certainly have been shot 1.37:1 as a negative ratio but with safe areas designed to be matted in projection. The 1.37:1 films are presented pillarboxed and the 1.85:1 films ever so slightly letterboxed within the 1.78:1 HD frame. Now the obvious stuff is out of the way, the technical nitty gritty. Sony have obviously really looked after these and I reckon negatives have been used rather than prints, but I stand to be corrected. The masters have had a huge amount of care taken and were probably supervised by Grover Crisp who’s reputation is extremely high in regard to producing topnotch HD masters. I’m sure that all were created for the fondly remembered Fuller DVD set from 2009. Powerhouse Films have used David Mackenzie and Fidelity in motion for the encodes and they’re flawless ... as usual. The grain fields in all of the films are extremely fine and well managed with none of the usual signs of poor encoding like smears, clumps or holes. This fine work combined with excellent masters means that Powerhouse has maximised the quality. The only potential quibble would be that each film could be given it’s own disc but the uptick due to an even more maximised bitrate would be negligible. Especially considering that the grouped films (discs 1-2) were shot 1.37:1 and are pillarboxed meaning that there’s less data and the fact they’re B&W also helps. Detail levels are exceptional in all types of shots (fore, medium, background) with only any downtick in quality being seen during optical work like scene fades betwixt scenes and during the credits / captions when they appear over live action footage. Black levels are also exceptional with no signs of crush. Contrast is is fine and subtle throughout with no blown out highlights or detail loss and allows the grain to show through; on DVDs grain could be lost in the slight fog of standard definition, not so here. The latter two widescreen films have more relaxed contrast than the the Academy framed efforts. I could see no damage at all, and I really scrutinised these. Incredible really, given the age of the movies. Once again a tribute to Sony and to their mastering process, and for the encoders and other staff at Powerhouse Films. For what it’s worth, apparently The Crimson Kimono looks better and has superior encoding to the supposedly already excellent Twilight Time release. An excellent collection of much loved films from the highly regarded screenwriter-director Fuller and superb transfers; what more is there to say. Audio on all of these films is very much the same. As with the images Sony have really looked after these films and the fidelity considering they’re very old 1.0 tracks is excellent; about as good as these soundtracks could be. Obviously as you move through the films in order of production the sound technology improves so that the sound mixes become more sophisticated in their sound design with more delicate integrations of dialogue, sound effects and score. I could hear no distortions to speak of although in the ‘30s films there was the occasional shrill moment, usually when the sound field builds to a crescendo and dialogue could be mildly (and I stress mildly) affected. Music is never intrusive on dialogue and modern audiences will find these a very different listening experience, especially as English-language cinema (and TV) has been infected ... sorry, influenced by modern Hollywood’s wall of sound approach and all pervasive scoring. Subtitles as always are a must for all fans who are hearing challenged, and of occasional use for those who’re not. For the most part the subtitle tracks covers all dialogue without being slapdash as on some discs out there, with nuance well represented. A short piece highlighting the appearance of the uncredited cameos (albeit played by actors) in It Happened in Hollywood or “... Once a Hero ...” in the big all-star party sequence. A useful, amusing and fascinating little featurette. The stars portrayed are: Bette Davis (Maxine Jerome), Myrna Loy (Lucille House), William S. Hart (unknown), Loretta Young (Margaret Wormser), Irene Dunne (Mary Minter), Victor McLaglen (Arthur McLaglen, his brother), W. C. Fields (James May), Mae West (Virginia Rendell), Franchot Tone (Gene Coogan), Charles Chaplin (Eugene DeVerdi), Melvyn Douglas (Dave Harper), Jean Harlow (Jean Seale), Ginger Rodgers (Beatrice Coleman), John Barrymore (John Bohn), Harold Lloyd (Frank Brown), Edward Arnold (Howard Bruce), Eddie Cantor (Frankie Farr), Joe E. Brown (Dow Clark), James Cagney (Bob O’Keefe), Sonja Henie (Mildred Gay), Marlene Dietrich (Carole Dietrich, no relation), Clark Gable (Philip Waldron), Greta Garbo (Betty Dietrich), Claudette Colbert (Berna Mack), Bing Crosby (Earl Haddon), Frederic March (Bill Meador), Joan Crawford (Sylvia Lamarr), Fred Astaire (Don Eddy), William Powell (W. W. ‘Doc’ Dearborn), George Raft (Al Constance) and finally Merle Oberon (Lorraine Bond). Short appreciations from three Hollywood alumni and one journalist who were fans of Fuller’s work. Robbins extensively interviewed Fuller for a documentary (see below) and Forshaw wrote a book on the man. An excellent series of HD still galleries; self explanatory. Theatrically released trailers heavy on the hyperbole and typical of their eras. 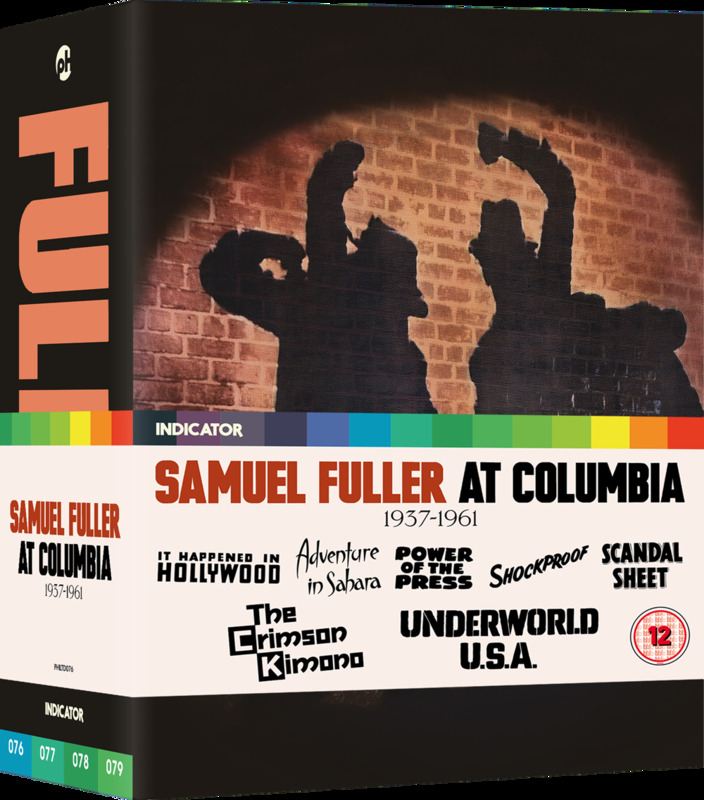 Hollywood illuminaries Martin Scorsese, Wim Wenders, Tim Robbins and Curtis Hanson in addition to Fuller’s daughters Christa and Samantha waxing lyrical on the life and work of Sam Fuller. A fine, informative interview conducted for the French TV series “Le divan d'Henry Chapier”. What is there to say about this stunning interview conducted by Tim Robbins for the documentary The Typewriter, the Rifle & the Movie Camera (1996) which in it’s final edit clocked in at 55 minutes. These are the full, unedited rushes totalling a whopping 404:32. Every possible aspect of Fuller’s career is covered; a must for any Fuller fanatic. The closest we get to a commentary on this set and it’s obvious that Wenders and Fuller like each other and the two make a great team in discussing the great man’s career. An archival recording from the Arri Cinema, Munich. No sound issues in evidence that I heard. Powerhouse’s booklets are among the best in the business of their type. Across these four discs (and the seven marvellous feckin’ feature films) we get 152 pages, count ‘em ... 152 pages of printed content, all of an extremely high quality. An incredible set that builds on the already well regarded 2009 R1 DVD set by adding so much incredible added value that it’s mind-blowing, namely the 400+ minute long Robbins-Fuller interview which is well worth the price of the set all by itself and I mean the full listed price! We also get all of the vintage material off prior DVDs and Blu-rays if that wasn’t enough! It’s becoming pleasingly repetitious, but yet again this Indicator Series boxed set from powerhouse Films has GOT to be on reviewers and fans best of the year lists. In every way possible this company are just knocking it out of the park: picture and sound quality as good as can be for HD with world class encoding and extras that are beyond wonderful and comprehensive.